Release Date: January 24th, 2007 (Film Forum) by The National Center for Jewish Film. In German and Slavik with subtitles. BASIC PREMISE: A documentary about Hans Ludin, a Nazi supporter executed for war crimes in 1947 and who left behind a widow and 6 children. ENTERTAINMENT VALUE: This emotionally powerful documentary begins as director Malte Ludin researches the role his father, Hans, played during World War II. 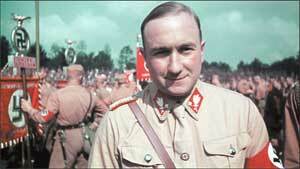 Hans gradually rose to power under Hitler’s Nazi regime as his storm trooper and, at the age of 28, as a commander of storm troopers. On December 9, 1947, he was executed for these war crimes. He never actually killed anyone, but he sentenced many Jews to be deported, which led to their death. Malte Ludin goes beyond just presenting the historical facts about his father. The rest of the film doesn’t provide new revelations about Hans, but rather about how his remaining family has coped with the harsh duality that he was both a father and a war criminal concurrently. Erika, his eldest sibling, seems to have bottled up her feelings the most because, when interviewed, she hesitates often and even shows anger. It’s fascinating to watch how everyone else reacts differently. Although, admittedly, it would have been helpful to include a bit more closure and synthesis, it could take many more years of reflection to reach any real closure to this very personal, touchy and complex subject matter. SPIRITUAL VALUE: By asking questions which have not been asked to his family members for 60 years, director Malte Ludin opens the floodgates of emotions. For many, especially his sister Erika, it’s a bit overwhelming and uncomfortable to be confronted with sensitive questions regarding Hans. It feels quite moving to watch them reflect and face the harsh truth and bring out their innate feelings which has been neglected and ignored for too long. Ultimately, Malte has managed to tear off a Band Aide from an old wound, so-to-speak, and to let the wound breathe for a change. Hopefully, it’ll heal on its own while exposed for all to see through this revealing documentary. IN A NUTSHELL: Emotionally powerful, revealing and bold.